*Note: You can substitute with chicken-apple sausage or sweet Italian sausage. In a large pot, bring six quarts of water to a boil. Cook the corn for four minutes, then remove with tongs and let cool. Keep the water on the stove on low heat. Cut the kernels off the cob and set aside. Slice the green and yellow zucchini lengthwise, preferably with a mandolin slicer. Next, trim the tough ends off the snow peas and set aside. On your cutting board, smash a small garlic clove with a knife, then sprinkle with 1/2 teaspoon of salt. Chop and smash together to make a paste. In a large mixing bowl, combine the cherry tomatoes, garlic paste, sherry vinegar, olive oil, caper berries and corn. Season to taste with a few grinds from your pepper mill. Add vegetable oil to a medium sauté pan and bring to medium-high heat. Cook the merguez sausages for one minute, then turn the heat to medium-low and finish cooking for five to six minutes, turning occasionally. Set aside. Bring the water back to a boil, then add two tablespoons of salt. Cook the pasta for eight minutes, or until al dente. Just before you remove the pasta, stir in the ribbons of zucchini and snow peas. Remove from heat after 30 seconds and strain everything into a colander. Add the pasta and vegetables directly to the cherry tomato mixture, then gently toss with a tablespoon of olive oil. Garnish with the chopped parsley and chives. 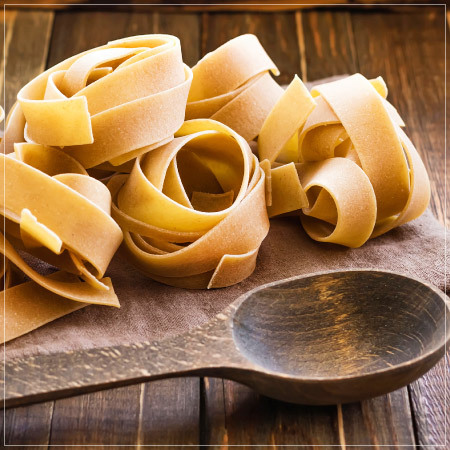 To finish your pappardelle pasta, evenly distribute the pasta and vegetables among four plates, place a sausage on top and sprinkle with Parmesan cheese. Enjoy with a glass of Far Niente Cabernet Sauvignon!